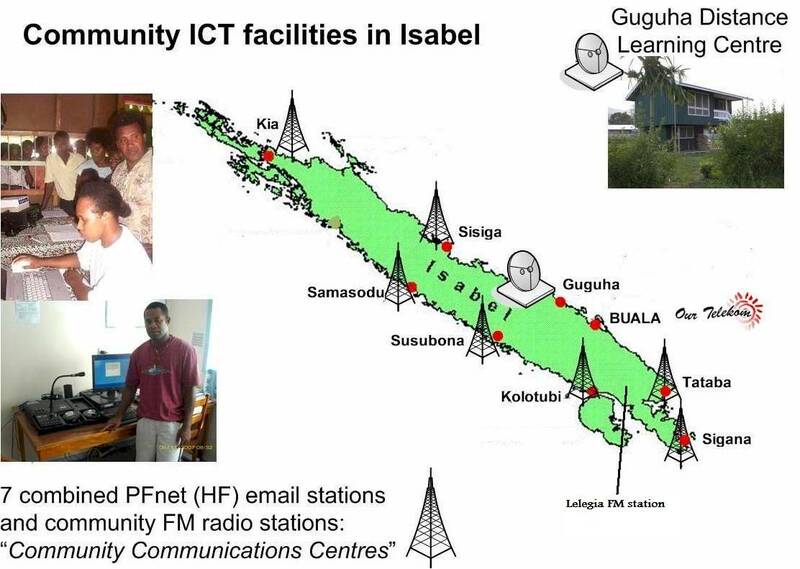 In 2006, UNDP and Isabel Provincial Government established eight low-power FM radio stations around Isabel Province in order to support growing governance institutions with improved two-way communications and flow of information. Communication infrastructure had remained a critical limiting factor in linking local governance processes especially in remote locations. The stations are hosted in villages, allowing for information sharing and local content development by the host communities. In addition to disseminating information to the remote communities, the system would carry information into the offices of government agencies, commercial establishments and civil society including the media, and even linked to the planning cycle. The eight FM stations are located at Buala, Tataba, Sigana, Lelegia, Kolotubi, Susubona, Samasodu and Kia villages. Seven of the stations are based in remote rural areas with no grid power, roads and only partial mobile coverage. They are solar powered and broadcast for 2-3 hours each evening, in variety of formats. The stations were co-located with People First Network email stations and named “Community Information Centres”. The ownership and governance of the stations lies with Isabel Province and the host communities. The stations have been managed by their host communities in close collaboration with the Province, and over the years have partnered with local and international organisations to assist with outreach and to develop their capacity and thus their sustainability. Each station is equipped with an “FM radio station in a suitcase”; a product of Wantok Enterprises of Canada. This consists of a mixing desk with feeds from two built-in CD players, cassette players and from a computer with pre-recorded and other digital audio. Each has a 100W transmitter and with locally constructed masts the coverage is excellent. It is estimated that at least 50% of the population of Isabel should fall within coverage of one of the stations when they are operational. Initially, the stations relied on mainly music with live announcements, news and messages, dedications and music. Informative broadcasts, for instance by the local agriculture officer or community health worker, were usually conducted live. Service messages, where people pay a small fee to have messages broadcast are an important feature in a rural area with poor communications infrastructure. 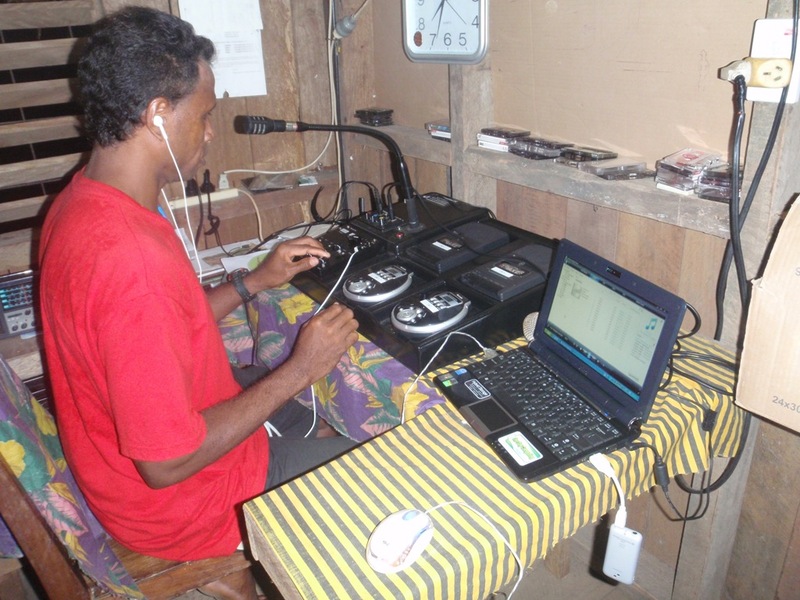 The IPDP engaged the assistance of the national broadcaster SIBC to provide training in broadcast techniques, and later on the Regional Media Centre of the Secretariat of the Pacific Community (SPC) also provided some training, as did Solomon Islands Media Assistance Programme (SOLMAS) indirectly through PFnet. Between 2009 and 2012, the Commonwealth of Learning engaged with Isabel Province (Community Affairs and Health Services), the national Ministry of Health’s Health Promotion Division, Solomon Islands Development Trust and People First Network and four of the station communities in a partnership under COL’s Healthy Communities programme. Healthy Communities brought together the partners to develop educational radio programmes on priority health issues called Community Learning Programmes (CLPs). The CLP is a model for non-formal learning developed by COL in several countries around the world, that blends participatory planning, learning and production with face to face and media methods and the use of ICTs. 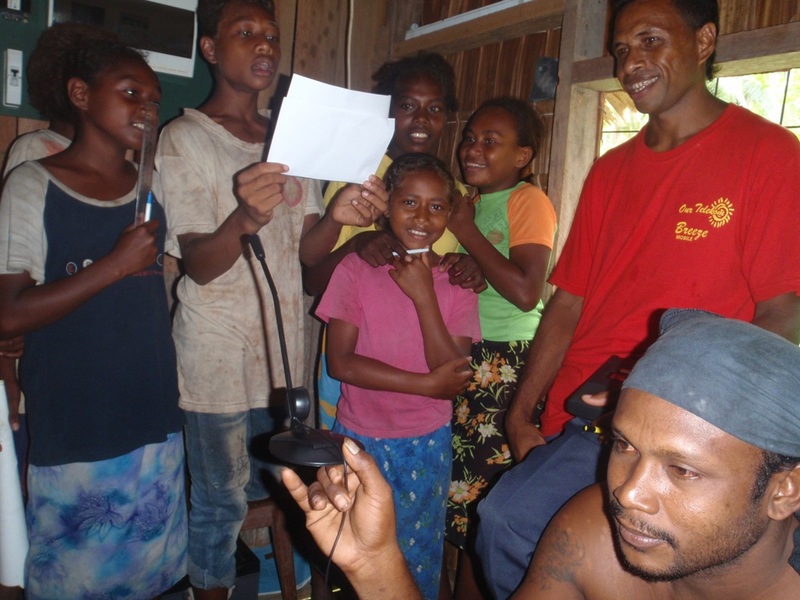 Communities collectively identify priority issues for learning, map out the key messages, programme formats, and in teams produce entertaining and educational radio content with a highly localised style and voice. The topics, priority health issues identified through participatory planning workshops, included healthy environment and lifestyle, diabetes prevention, teenage pregnancy and STIs. Workshops were held with the facilitation of COL, SIDT and PFnet to design and operationalise the learning programmes and build the skills and capacities for the content development and production of the radio programmes. With input from SIDT’s drama team and the involvement of youth group members , a great deal of creativity was enthusiastically unleashed and the final productions included many formats such as drama, music and song, debates, school quizzes, and formal presentations. School children were invited to record the theme tune to Susubona’s “Na au fa keli” (good life) programme, and they also recorded jingles. Series of digitally recorded radio programmes on priority health issues were developed, produced and broadcast in 2010-11. Some examples can be heard in the archive. In 2012, an advocacy workshop on C4D was held for decision makers of Isabel Province, to raise awareness of how such approaches might support Isabel Province programmes. The CLP model has been used in several other countries. The second phase of Healthy Communities included a research and evaluation component though which data and evidence of the impacts of the approach (in other countries) is now available. The name “Isabel Learning Network” refers to the participating stations and partners of the specific initiative under COL’s Healthy Communities only. It is not the overall name for the radio stations network. The Solomon Islands is a nation of around half a million people scattered over an area (EEZ) of the South West Pacific the size of France, Germany and Spain combined, although the total area of land is only 28,000 sq km. The islands only became an independent state in 1978, and the concept of nationhood in the islands is a recent one that hardly existed before the British declared a protectorate over the southern Solomons in 1893. 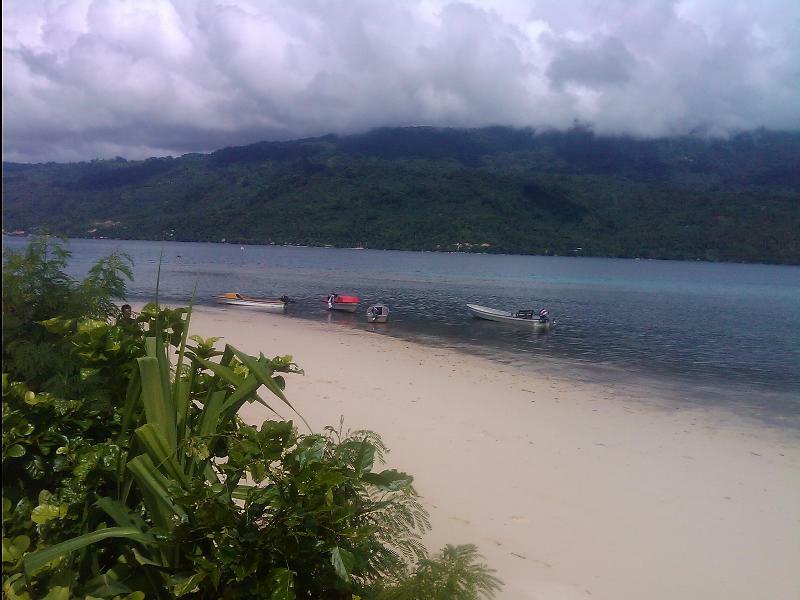 The country is peopled by a Melanesian majority, with Polynesians, Micronesians, Europeans and Chinese. The diversity is illustrated by the large number of languages spoken (more than 80). The Solomons is a Least Developed Country as classified by the UN, and around 85 percent of the population live in rural villages. There are over 347 permanently inhabited islands of which six are large. The population growth rate is approximately 2.8% (2007). Around 80% of the population are largely engaged in subsistence agriculture. More than half the formal employment is concentrated in and around the national capital Honiara. Between 1999 and 2002 the country experienced a breakdown of law and order which was restored with the arrival of the military intervention force, Regional Assistance Mission to Solomon Islands (RAMSI) in mid 2003. The “tension”, as it is known in the Solomons, was exploited by political and criminal opportunists and fuelled by corruptive influences of the logging industry. The conflict was interlinked with another ethnic conflict that preceded it, in neighbouring Bougainville, a province of Papua New Guinea, between 1988 and 1997. Following the tension, improving access and quality in education and in providing opportunities for school leavers through continuing and adult/vocational education has been officially recognised by the Government and donor partners as an important contributing factor in peace building. 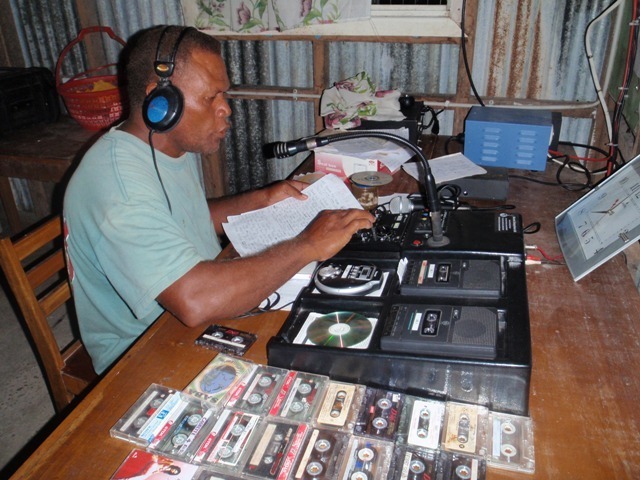 Studies of media and communication systems in Solomon Islands indicate that most people, and in particular the 85% living in rural locations, are information poor, and that this is manifest in different ways, such as lack of access to market information for rural producers; lack of access to information to assert human rights; lack of information to empower and enhance the role of women in society and the absence of an information environment to complement and reinforce the education system. In a country that is highly diverse in terms of ethnicity, religion, traditional governance, land ownership (lineality) and language, Isabel (or Ysabel) Province has long been a settled and unified province. The province has a total area of 4,156 square kilometres with vast resources. Most of the land is rugged and mountainous with 2.3 percent of the total land identified as Agriculture Opportunity Area. People on Isabel have a strong affiliation to their culture and to Christianity. Chiefs govern village affairs, land issues, and mandate the cultural practices. Traditionally land ownership is passed through matrilineal system. There are 8 main languages spoken, plus Solomon Pidgin. English is the official administrative language, but is spoken confidently mainly by the young and educated only. Isabel is mostly rural with no road other than a few kilometres of unsealed track near the capital and one or two other locations. Most villages are located on the coast and travel is almost exclusively by sea. Isabel is connected to the capital Honiara by three Twin Otter flights per week from the provincial capital, Buala. Telecommunications are improving with expanding mobile coverage but this only covers perhaps 50% of the land area of Isabel at present (2011). The provincial government based in Buala provides its service delivery through substations, which are located in the rural areas. Over the years, the national government grants in area of health, education and recurrent services have been the main source of revenue for the province. The provincial government has earned a small amount of income from business licenses and the major provincial expenditure is civil service salaries. The formal employment of the province is small, making up only about a fifth of the working age population. Other income earning activities are from copra and cocoa, logging and marine products. Most people are either self employed, or working in the subsistence sector to provide for own consumption. Isabel has the second lowest child literacy rate and the lowest adult literacy rate in the country. Despite the matrilineal land ownership system, women hold very few positions in the “Tripod” governance system of Isabel, which consists of the Provincial Authority, Council of Chiefs and the Church and is reflected right down to the village based governance structures. Isabel has well-organised Youth development coordinated by the province through its Ministry of Community Affairs (MCA). In early 2009 Isabel Province with national stakeholders launched their Youth Policy and Action Plan. This was a first for all the provinces. The Plan “recognises young males and females as the basis of the community and seeks to develop their optimum potential and promote their active partnership in the socio-economic and cultural sphere in Isabel”. It affirms the principles of the international Convention of the Rights of the Child, and develops a set of principles, key strategies, priority target groups and implementation mechanisms, and then charts out a detailed action plan. Women are also well unified in Isabel Province. The main organisation, with members in all villages, is the Mother’s Union. This provides a solid foundation for Youth and Women’s collaboration, ensuring a common approach with all stakeholders working together. what is the aim of that project to them? ?